Years and years ago, when I was a littl'un, my dad did a one year teaching exchange in Japan. We missed him, a lot, but the fabulous thing was that my mum took my sisters and I over to visit him for five weeks. It was amazing. In the months before leaving dad had been teaching us the Japanese alphabet as well as a heap of verbs, and ever since then I've been completely and utterly fascinated by the culture. I did study the language in my HSC at school and absolutely devoured it, then for some reason never continued. A couple of weeks ago a friend at work mentioned that a Hyakuen store had opened up in Sydney. For those not familiar, Hyakyen stores are essentialy Japanese discount stores, stocking everything from cute chopsticks to storage containers, stationary to froggy shaped wash cloths, for 100yen. In Australia the typical price is $2.50-$2.80, and it's amazing. 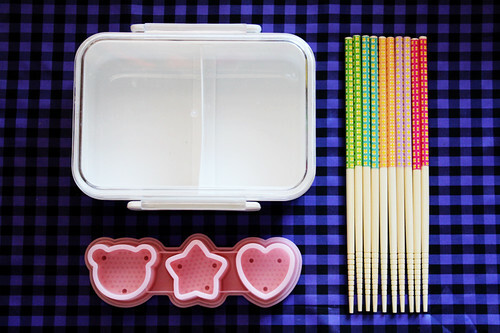 Clockwise from top left: Bento box with divider, colourful chopsticks (which I plan to mismatch), and a 3-in-1 rice cake mold. Clockwise from bottom left: 2 egg molds (yep, pop a hot hard boiled egg in these babies and they come out all cutesy! 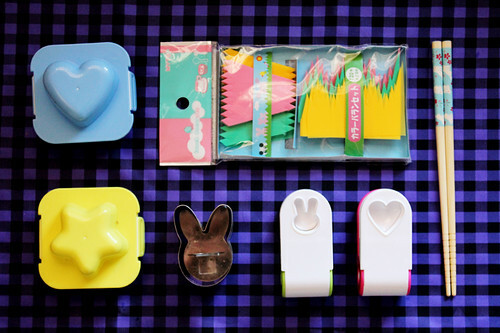 ), bento grass, bunny chopsticks, seaweed puches, and a bunny rick cake mold. Not sure what a bento box is? See here this lovely pinterest board! Don't worry, I'll be sharing some of my fancier bento boxes right here!